These filters will fit into any Brita water filter pitcher or dispenser that uses the OB03 replacement. Each water pitcher replacement filter cartridge manufactured by Brita will reduce up to 99% of contaminants, ranging from mercury to lead, from up to 40 gallons of drinking water. These filters have also been tested and certified by NSF International and the Water Quality Association (WQA) to meet or exceed NSF/ANSI Standards 42 & 53. Available here in a 4-pack. 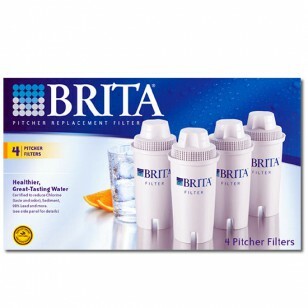 Order the Brita 42432 water filter pitcher replacement cartridges from us today! The BRITA-PITCHER-FILTER-4PK does not reduce fluoride.